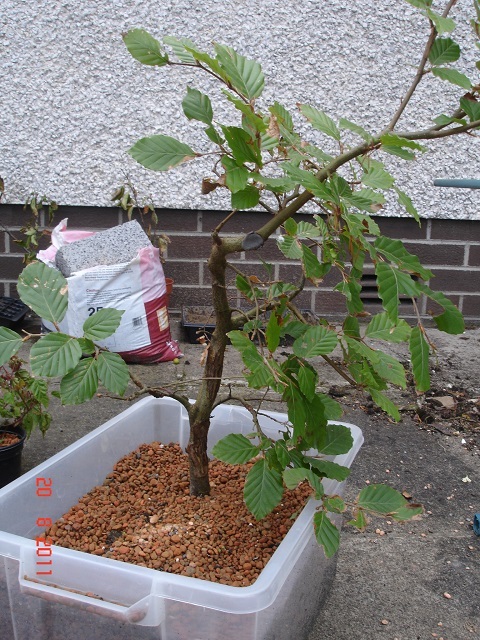 This is a European beech that is nicknamed after the friend whose garden I ‘rescued’ it from in the summer of 2011. I say rescued because he thought it was a weed and was in the process of resurfacing old flower beds in the garden of the house he just bought. By chance I happened to be there for a barbeque and having started my bonsai interest, I noticed the plant and asked him of I could give it a home – not because it was really nice, mature material, just because I wanted anything I could get my hands on! 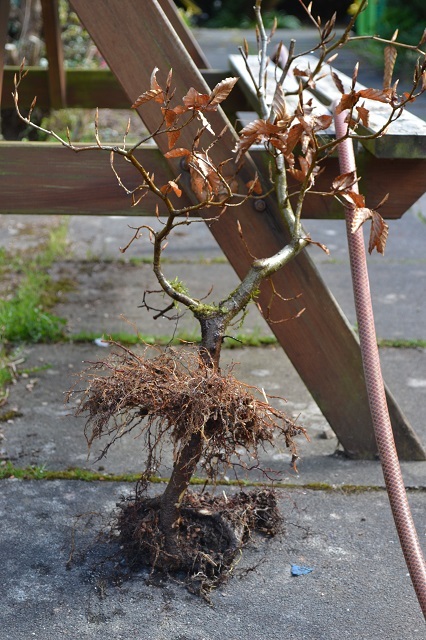 Anyway I knew enough to realise that it was definitely out of season for rootpruning/repotting and that it was a big gamble trying but had a go anyway. I just took a spade to it and cut around it. It didn’t come out easily but I persevered and took it home in a plastic bag. 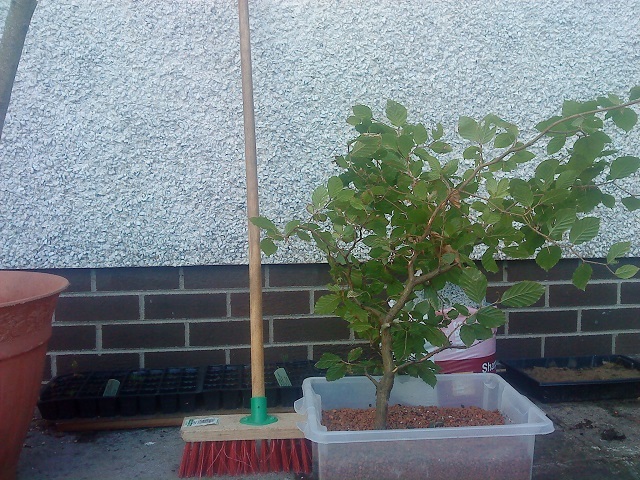 It was potted straight away into pure cat litter, placed in the shade and frequently misted. I crossed my fingers for the next while. Over a month later it was still green so I started giving it a low dosage feed. You can see the lower trunk suffered considerable strimmer damage and was quite thin at the point of the scarring. I knew that this inverse taper was a major problem so the following spring I decided to put the tree in the ground and put a wire tourniquet on to produce a new root system above the damage. The tree didn’t have existing nebari and I found out that the root mass was concentrated around one heavy tap root. The tourniquet would solve both issues. 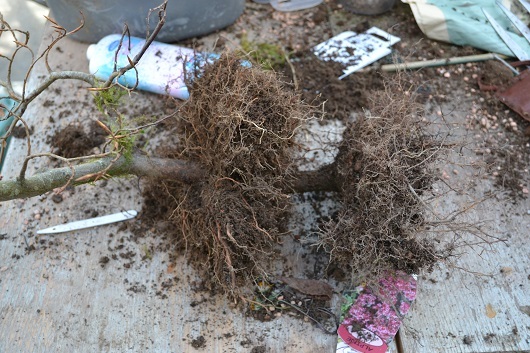 So I left it for three years in the heavy clay soil of my new house and it hasn’t grown much at all above ground but a couple of weeks ago I lifted it and I can see where all the energy went – into the new root system. Note the length of trunk between the two root systems. 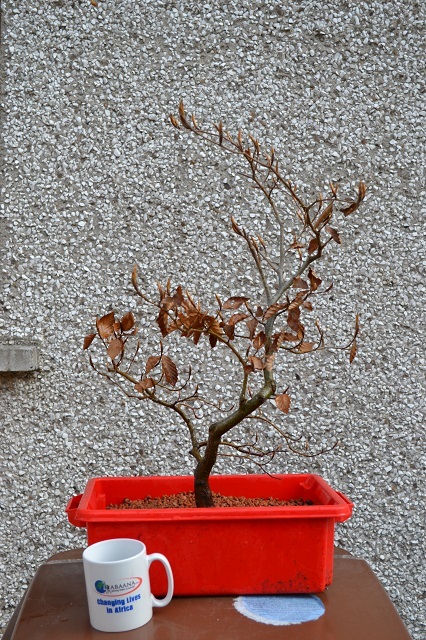 Note the original thick tap root – unsuitable for bonsai. 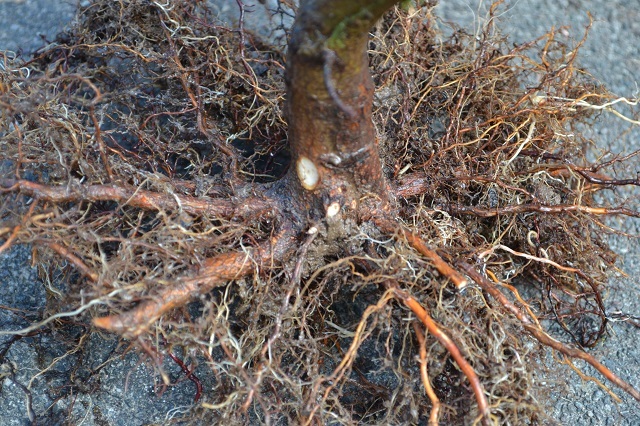 The trunk is also thicker above the new root mass. Since this last photo was taken a few weeks ago, it has now budded out and leaves are making an appearance. Looking forward to working with this one.